This is our newer and improved tool to assist you in the Elliott Wave counting, which represents an improved version of the ElliottWaveTool7pasos idea. Start by clicking the "<>" button to indicate you want to deselect any previous wave (if applied). Set the pattern's type that you want to count (if you do not have our free Elliott Wave Font, you will see the letters instead of the pattern's icons in the Type's Section buttons: I=Impulse, D=Diagonal, Z=Zigzag, F=Flat, C=Combination or double zigzag). If needed, set the sub-pattern. Set the degree (and instance) by clicking the "+" or "-" panel's buttons. Set the color (this will help you to differentiate between alternate wave counts) by clicking the colored square button. The next wave you are going to place will be displayed in the "Add Wave" button (the bigger one on the panel). Click on it when ready. If the wave is starting the pattern, you will see the indication "Set Start" at the mouse cursor. Move your mouse to the desired bar where your wave starts. A red line will indicate the bar that you are pointing at. If you place your mouse below the bar the low of the bar will be used as price reference, if you place your pointer above the bar the high of it will be the price reference. Make a click when ready. After setting the wave's start point, the first wave will appear under the mouse. This could be 1, A or W depending upon the pattern that you are counting. In the same manner, set the point for placing the first wave. No matter how high or low you place your wave, the red line will be your wave's time reference, and the high (if you clicked above the bar) or the low (if you clicked below the bar) will be your wave's price reference. Price reference and time reference will be used to calculate the projections for the next waves. After you set your wave on the chart, you will immediately see the projections for the next wave. Also, the following wave for the actual wave count will be displayed in the "Add Wave" button. You can pause a wave count and change to count other pattern by clicking the "<>" button any time you are not dragging a wave. If you want to change the position of a wave, double click on it as if you were to select it and then the wave will stick to your mouse. And as if you were placing it for the first time, set its new position. If you want to cancel the placing process, just press Esc key on your keyboard. 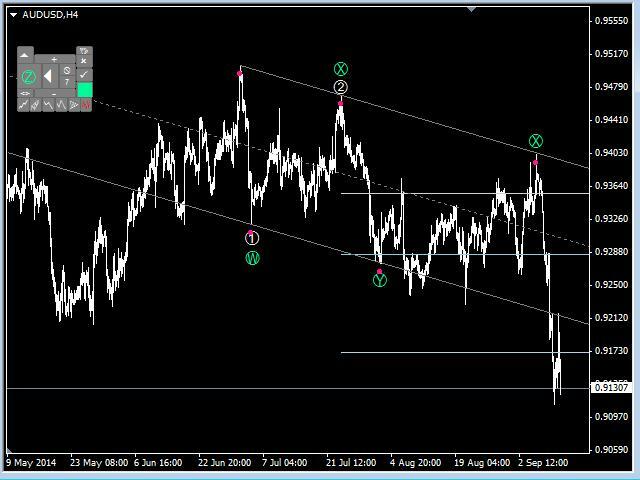 Once you placed in your chart an entire wave sequence for the selected pattern, the first wave again will be displayed. If you add this wave by clicking again the "Add Wave" button, a new pattern of the same kind will be counted. You can place up to 100 identical patterns with the very same color degree and instance. Just click on one of the pattern's waves, and then click the button with the white triangle pointing to the left: the last wave of your pattern will be deleted. Click the button as many times as you need to reach the desired wave and delete it. To change any of the characteristics of a pattern, just click on any of its waves and then click on the new characteristic you want to apply. For example, if you want to change a 1, 2, 3, 4 impulsive pattern for a W, X, Y, X pattern, click on any of the waves, then click the combination button and then the desired kind of pattern (for combinations you can choose "DTZ" for double or triple zigzags or "DTC" for double or triple combinations). Once you click the button of your choice, you will see how the tool changes all the waves for the new right pattern and the new projections (if applied). You can change color, degree and pattern at any time. 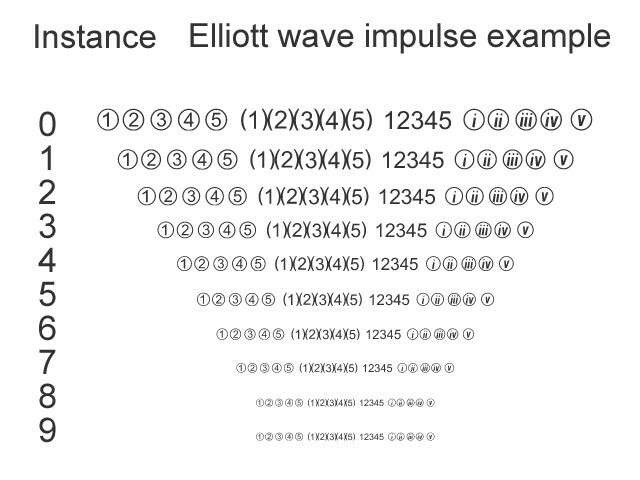 Elliott Wave Assistant is empowered with our exclusive PerfectLine. Please watch the demo video to see the tool working. Mas que exelente es algo elemental en el trading felicitaciones! I love this Elliot Wave Assistant Tool that I purchased 4 days ago! It is so easy to use, powerful and yet user friendly. 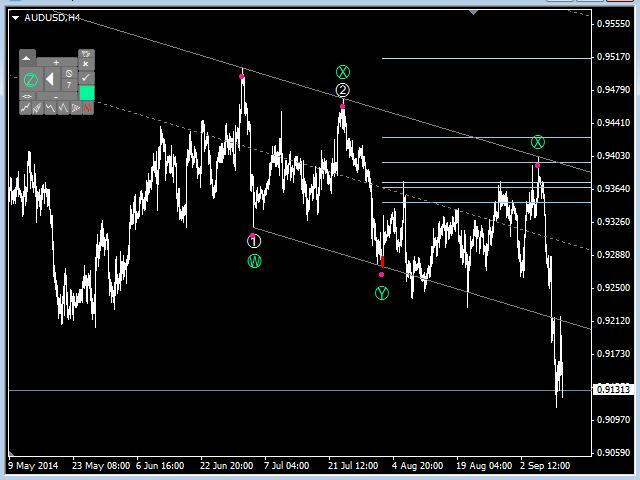 I am learning how to count Elliot Waves and using MT4 platform. This tool saved me so much time and it also checks to see if there is overlap to ensure that I don't make the wrong count for a 5 wave sequence. It also provides Fibonacci as well. Sergio did a fantastic job! Anyone who is using the MT4 platform to count Elliot Wave should definitely purchase this tool. It is INVALUABLE in my opinion. Este es el único producto de su tipo disponible para MT4, facilita mucho el conteo, eso ahorra mucho tiempo. Las proyecciones son también muy útiles y el autor siempre está disponible para soporte técnico. Recomiendo leer bien las instrucciones antes de empezar a usarlo. Very useful tool for fast and manual labeling the charts. if you dont have much time and if you are active trader, then this may be the right indicator for you. I am using it regularly on a daily basis with my service. Excelente herramienta, extremadamente eficiente y fácil de usar, en relación eficiencia/ precio resulta verdaderamente muy económica ya que ahorras muchísimo tiempo en la etiquetación de ondas en donde se encuentren ( Extemadamente precisa en todos los marcos temporales) además del tiempo ahorrado en actualizaciones o correcciones. La proyección de los canales y la proyección de objetivos o retrocesos para cada tipo de Onda o situación son GENIALES !! El apoyo técnico post - venta es Excelente !! La recomiendo con 5 Estrellas ! Agrega función automática para eliminar ondas vacías (donde se generó el origen de una onda pero luego usuario ya no continuó con dicho conteo), lo que causaba retomar conteos de ondas previamente iniciados y que se suponían inexistentes. - Arreglo de detalles mínimos del código. - Cambio de tamaño de algunos botones para alinear con nuevo tamaño de botones en la versión 735.